Our camping registration is closed for 2018. Please check back in early 2019 for next summer’s dates! If your child likes swimming, arts & crafts, archery, and the high ropes, then they’ll love our Adventure Camp. Every year The Salvation Army in London sends dozens of children to summer camp. Children ages 6 – 15 who might not otherwise have an opportunity to have a holiday are sent to Adventure Camp. Camp is an experience like no other in which young peoples’ lives and outlook can change forever. At camp, young people get to try new experiences, make new friends, learn team and leadership skills which can benefit them throughout their lives. In our world of technology, camp is a place where young people can be kids again and learn to do those things that kids should love to do, be it swimming in the lake, hiking in the woods, mountain biking, canoeing, climbing, sports and wacky games. Race along the bike trails . Conquer the heights of the Ropes course. Venture out on the kayaks. 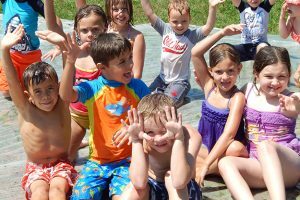 Experience Newport Adventure Camp this summer! This camp is about new things…experiencing the wilderness of Muskoka, swimming in the blue water of Skeleton Lake or shooting hoops on the new basketball court. There are amazing theme days, activities together as a cabin group or camp wide events that are bursting with excitement. Come and experience what camp is all about this summer. At camp you will have fun at Bible study, sports, skits, skill training, theme days and so much more. Camp is a place where you make lifelong friends. Our subsidy helps cover transportation, meals and accommodation for a five day outdoor adventure at our camps. Registrations by appointment only. Please call 519-661-0343 ext 230 for more information or to register your child.